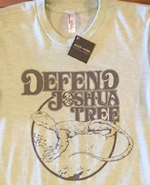 DEFEND JOSHUA TREE … FROM WHAT, EXACTLY? * The Depierro Development Corporation, who since 2011 have been working to install a 9,100-sq ft Dollar General franchise store in downtown Joshua Tree at the northeast corner of Sunburst and the 62. Dollar General excels at making easy money off low-income people and sending the profits out of the local community. Joshua Tree does need a proper general store, but this crap-peddling, ugly out-of-state bottom-feeding predator isn’t the one for us. * NextEra, who have been trying to build a fenced, 160-acre solar farm on Sunfair Road at the old airport property, within view of the National Park. Although currently stalled, the fences constructed for this development have already disrupted an important wildlife corridor. * The developers of the AltaMira gated community project, which would suburbanize a portion of Joshua Tree. This woefully wrongheaded project has reportedly stalled for now. * The Trump Administration, who shut down the government in early 2019 but ordered Joshua Tree National Park left open, woefully understaffed, which (predictably) let the bad behavior of some visitors flourish. Then there’s the plague of illegal off-road vehicle riders, who routinely disrupt the natural peace, destroy wilderness and wildlife, leave behind garbage, and use up costly local resources in law enforcement and emergency services. And the nighttime light polluters, who are degrading our view of the stars. An ecology can’t defend itself from human greed, error and shortsightedness. That takes you and me, working together in the interest of the place itself. So let’s Defend Joshua Tree…before it’s too late. Dave Reeves wrote many great columns and articles for Arthur, a magazine I (Jay) founded/edited/published from 2002-08, and provided much raw fuel and blazing inspiration for that project. But his real claim to fame and fortune is that he was the originator of the Defend Brooklyn T-shirt in 1996. The “Defend [where you live]” concept is a brilliant one, in and of itself — read Dave’s essay series if you want the background philosophy, history and some great riffs on how culture works. But the “Defend” concept is also fantastic because it can be applied anywhere (which is one of the reasons why it’s been ripped off so many times). DEFEND JOSHUA TREE is operated by Jay Babcock.